Once a rustic cuisine, Bukhara’s Carte Du Jour was enjoyed in the harsh rugged terrain of the North West Frontier, bringing comfort and succor to diners with its warm and robust flavors. 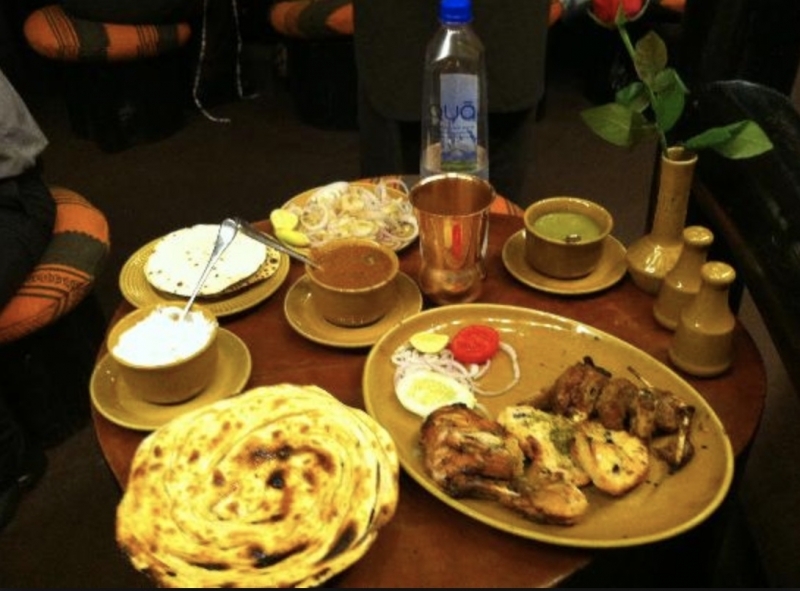 Today, Bukhara has perfected the art of cuisine, which is evident in its star dishes - the Bukhara Sikandri Raan, Bukhara Murgh Malai kababs , the iconic Dal Bukhara which is a combination of whole black lentils (urad dal), tomatoes, ginger and garlic, cooked and simmered over slow coal fires of the tandoor overnight for 18 hours at a stretch. A beacon of culinary excellence across the globe, Bukhara has won innumerable accolades over the years, making it the only globally recognized Indian restaurant and the preferred dining destination of gourmets, presidents and heads of state for over 35 years. Join us as we honor the authentic North-West Frontier flavors, unchanged and unmatched since 1978, accompanied with our extraordinary chefs, who have made Bukhara an unrivalled Global Culinary Destination. The interior is suggestive of a bygone age, evoking a sense of old-world charm. 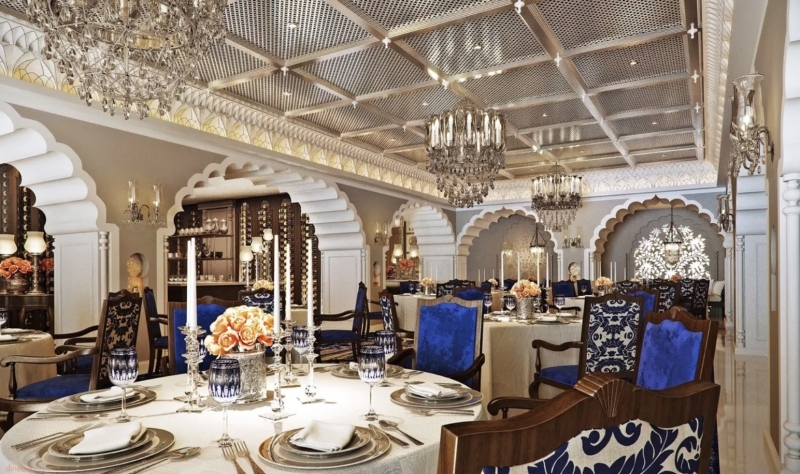 The ornamental chandeliers add to the grand setting, a fitting backdrop for serving the 200-year old cuisine of the Awadhi Nawabs. Dum pukht is a process of cooking by steam, where the ingredients are literally cooked in their own juices to bring out true aromatic flavors. The heritage thus continues with a regal spread of sumptuous fare served by courses. Preparations like motia pulao rehmani, murgh chandi tikka, dum pukht badin jaan and shahi nehari are served with a variety of breads traditionally prepared in the tandoor in great presentation. As the grand finale of a lavish meal, desserts garnished with the finest gossamer of gold and silver add the ultimate crowning touch. The restaurant offers not just a stint with royal cuisine, but a heavenly experience that gratifies one’s appetite and senses alike. A massive hit among famous visitors, celebrities who have eaten here include numerous Bollywood stars as well as the president of Singapore. The restaurant, which was seven years in the making, is completely hand painted with vegetable and flower dyes by mural painters brought in especially from a temple in Kerala’s Guruvayur. 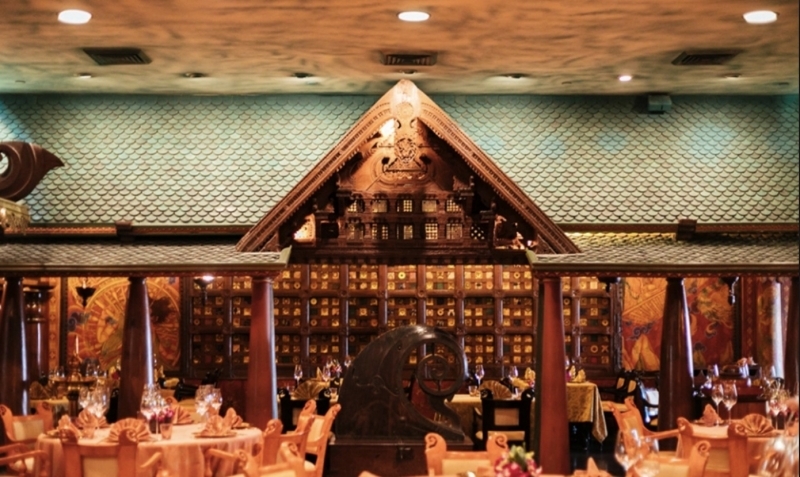 Designed on the principles of feng shui, The Spice Route is a treasure trove of antiques and is divided into nine different sections, each depicting part of the journey of life. Besides the stunning decor, The Spice Route boasts a menu that will hook the taste buds of even the most seasoned food connoisseur. Orchestrated with passion by the chef, Veena Arora, the menu is crafted almost artistically with gems such as chemeen thoren (Kerala style prawns, stir-fried with coconut, curry leaves and black tamarind and flavored with mustard seeds), tom yum kung (the famous Thai soup with prawns, flavored with lemon grass, lemon leaves and galangal), kung nang phad khing (stir-fried lobster with ginger and Thai black mushrooms, served in the shell), kaeng kheow waan kai (chicken in Thai green curry with pea and cherry eggplants) and phad phak (chef’s special stir-fried baby pok-choy with black mushrooms, flavored with soya bean paste). The restaurant’s courtyard transports guests to the wonderful world of Southeast Asia – adorned with traditional Thai sculptures, from the Chiang Mai region in northern Thailand, it is a visual spectacle. When it comes to tracing the evolution of culinary taste in India, the opening of Wasabi by Morimoto is a milestone. 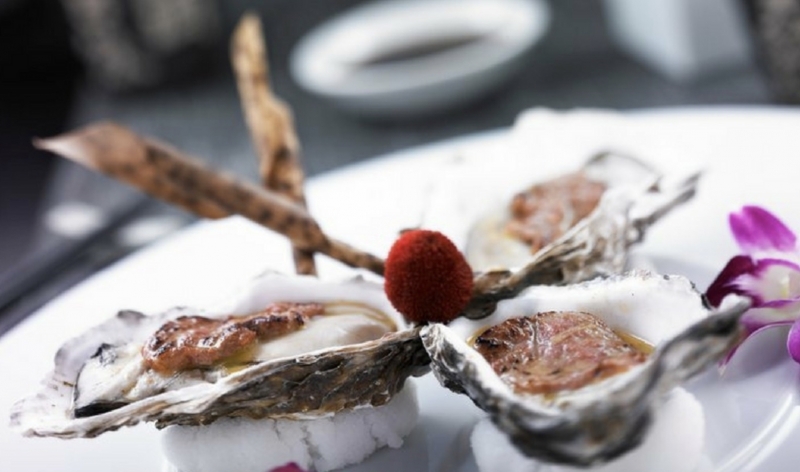 Few imagined that authentic Japanese fare—let alone raw fish in any form—would be given so warm a welcome, despite the collaboration with world-renowned Iron Chef Masaharu Morimoto. But the celebrated brand now has two outposts in the country, and is the default go-to spot for those who really know their sushi. An air of reverence still flows through the space: patrons respect the tremendously skilled chefs, who in turn hold their ingredients in high esteem, knowing the logistics involved in importing fresh fish and wasabi from Tsujuki several times each week. Regulars appreciate the personalised chopsticks, sake selection and the warm service—and also know to start with the whitefish carpaccio and order the black cod miso. 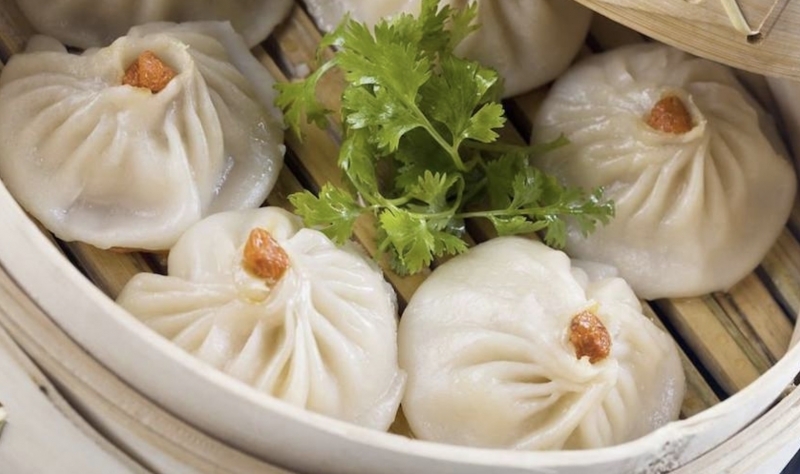 The China Kitchen is a contemporary Chinese restaurant in Delhi that introduced the city to the first-of-its-kind stylized interpretation of the traditional Chinese dining experience. With over seven chefs from China, each a master of their specialty, the restaurant offers the perfect introduction to authentic Chinese cuisine. The China Kitchen at Hyatt Regency Delhi marks 11 years of serving authentic Chinese cuisine with an all-new menu this August. Inspired by Beijing Street Style food, the new menu will showcase an array of veg and non-veg dimsums, wok fry chilli prawn, clay pot chicken, poached broccoli amongst other delicious offerings. Offering signature Chinese delicacies ranging from Peking Duck and an array of dim sums to hand-pulled and Dan-Dan noodles accompanied by a host of sumptuous desserts, the menu at The China Kitchen brings together tradition and timelessness. 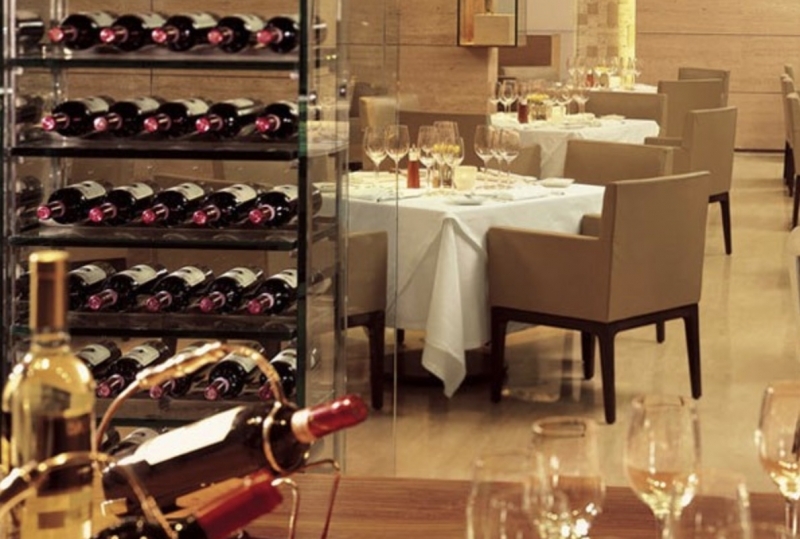 Located at the lobby level of the Oberoi Hotel, the restaurant offers seating for 58 guests. The culinary essence of this restaurant is traditional and authentic Italian cuisine with a strong creative element. The menu offers a variety of fresh homemade pastas and also offers a rare Italian cheese menu that includes popular cheeses from various regions of Italy. To ensure authentic flavor and taste, most of the ingredients used are sourced directly from Italy. The restaurant takes its name from a stone that plays a strong part in the design and interiors – a honey-colored stone typical to Italy that was most commonly used by the ancient Romans. The main restaurant wall makes use of the inherent transparency of the stone where a soft back light creates an unusual effect that highlights its quality and elegance. While dining here, in such beautiful surroundings, don’t forget to take advantage of the extensive Italian wine selection from the enoteca wine cellar.